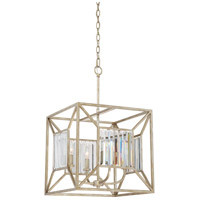 Sabrina - VG Vintage Gold Finish, Cage Chandelier With 4 Lights: A remarkable finish with striking glass accents highlights the design of the Sabrina foyer chandelier. The unique boxed shape of the framework draws your eye to the center on each side to showcase the shimmering beveled crystal-glass. The Vintage Gold finish is painted in a soft silvery-gold and features black speckling that adds dimension and radiance.